To find out what's going on at the moment, see the Latest News page. The Pightle is an area of nearly 6 and a half acres of unspoilt countryside. The name is taken from an old map of Eaton Socon showing names of fields in the early 1800’s. The Pightle can be found along the ‘Back Path’, which is a footpath stretching from Eaton Ford to Eaton Socon Church. The footpath runs between the modern housing and the meadows running alongside the River Great Ouse. 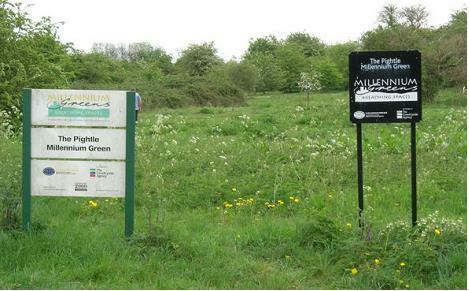 The field is immediately behind Capulet Close and can be identified by the new fencing and the sign. Access is by foot only. There are stiles at each end of the field and a wide flat entrance, suitable for wheelchairs and mobility scooters, in the middle of the fencing. Car parking is available near St Mary’s Church. From the church follow the footpath through the churchyard and northwards past the cricket ground. The Pightle will be found on the right. The Pightle was bought in 1999 with money from St Neots Town Council and with a grant given by the Countryside Commission. Landscape 2000, a local environmental group helped enormously in the acquisition of the land. Who is on the Trust Committee? Committee members include representatives from St Neots Town Council, Eatons Community Association and local residents. Meetings are held regularly. The Trust’s AGM’s are held in May in St Mary’s Church Hall, Eaton Socon. Everyone is welcome to attend. Can the Pightle ever be built on or developed in any way? The short answer is that nothing can be done with the land without the Trustees' permission. The Trust was set up to preserve the land as a leisure amenity. It cannot be built on or developed for housing in any way. How is The Pightle managed? The Trustees ask advice from many groups about the management of The Pightle. Some of the groups include wildlife enthusiasts, fishermen, the Town Council, bird groups and interested local residents. There are groups who collect litter, cut the grass area a limited number of times each year, plant hedging and trees, trim the bushes and brambles and groups of people who walk their dogs. Who can use The Pightle? Everyone is welcome to the Pightle and are encouraged to maintain it as an area of unspoilt countryside for the benefit of other people. There are tracks down to the river, small fishing spots, a variety of wildlife to look at and a specially-carved seat made out of redwood for sitting in and thinking or for moments of quiet contemplation. In autumn there are many unspoilt and untainted blackberry bushes where blackberries can be collected without any fear of traffic fumes. The Pightle is a natural area but it does have to be managed to prevent hawthorn and brambles covering the entire area. A small group of volunteers maintain The Pightle. Could you spare an hour or two to help? All help is very much appreciated. The Pightle is there for you to enjoy. Please wander round and enjoy our natural haven.